Fourchon shore base team secures Jack St Malo load for transport. Offloading, transferring, fastening, and securing heavy equipment for transport is what our shore base teams do best, and this recent project is a good illustration of their challenging daily work. 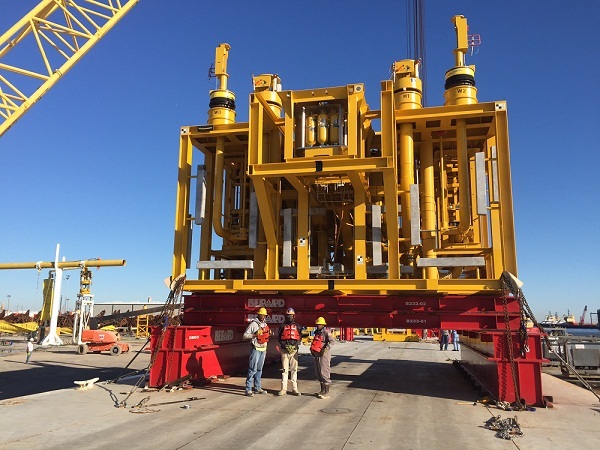 As part of Chevron Jack & St. Malo Stage 2 Project, in the Gulf of Mexico, InterMoor was contracted by McDermott to handle the transfer of the Chevron Chemical Distribution Unit (CDU) and Manifold from an inland barge to an offshore barge. Both were secured for transport by InterMoor from their dock in Fourchon, Louisiana. InterMoor’s welders also installed grillage as per McDermott design and welded sea fastening onto the offshore barge. The Manifold weighted 207.8Te and the CDU weighed 18Te. The team used the 880-Ton crane, which is available on site in Fourchon. For more on our shore base services, visit this page on our website.